They are each dressed neatly but with varying degrees of formality. Overall, the girls have taken more care with their appearance: several are wearing evening gowns, including all of the harpists, and most are wearing dresses, and makeup. Most of the girls wear heels, and most of the boys wear ties. Several contestants – both boys and girls – are dressed austerely in black: these are the veterans, for whom this audition is only one of many they will undergo through their adolescence and into early adulthood. They have already adopted the classical musician’s uniform and have a wardrobe of blacks in their closet ready for occasions like today – no need to plan ahead for what to wear to the audition for these contestants, it’s only necessary to be certain it’s been laundered since the last performance or audition. Many of them do not know each other, and may never meet – the auditions are at fifteen minute intervals beginning at 10 am, and the process demands less than an hour of each contestant’s time, so those who audition in the morning have left long before those scheduled for the afternoon arrive. Many of them will not even know who most of their competitors were, as no list has been made public. A pair of siblings entered and are competing against each other as well as their peers, but otherwise the contestants all come from separate families, and from all directions – some have driven long distances to be here today. Of those who attend school, about half of them are enrolled at private schools and half attend public schools. Finding the time and instruction to adequately prepare for today’s event is a great challenge for these students, especially those at public schools, whose emphasis on group instruction and high student-to-teacher ratio (many high school instrumental ensembles include more than 60 players) largely preclude their ability to educate students to play at this level. All of the contestants take private lessons on their instruments, but the demands of school life can create distractions or competing demands that make it difficult or impossible for a student to carve out enough time to devote to preparing for events like this. More than a third of them are homeschooled, and have a distinct advantage. Free from the strict demands placed on one’s time by a school’s schedule and classes, and the time consumed traveling to and from school each day, these students have a lot more time available to practice than the others, to attend extra lessons, master classes, workshops, programs…in short, they have a greater opportunity to focus their effort on developing virtuosity. Virtuosity is the goal. This is a solo competition – the grand prize winner, if he or she passes muster, may have the opportunity to perform a concerto movement as soloist with one of the finest orchestras in the country, in one of the finest halls in the world. The prize is the fulfillment of a dream, and today is a trial by fire. Not all of the contestants have this dream. For some, today’s event is an excruciating torture. They did not want to do this, but entered on the advice of their parents or private teachers, who encouraged them to apply or demanded that they go through this. Many, perhaps even most musicians are not soloists by nature – music is a social art, and many are content to lend their voices to the ensemble without stepping out in front of everybody else. These contestants will not win, nor do they expect or hope to. Nonetheless, all of those here today love music, or (in a few cases) did at some point before the struggle to attain virtuosity became paramount and crowded out their original impulse, replacing it with a kind of athleticism tinged with the gnawing suspicion that they are no longer doing this for the right reason. Fortunately most of the contestants are too young to have become this jaded. Most children who have developed skill on an instrument to this level have a good measure of natural talent driven by a constant replenishment of delight in music-making – delight in their own accomplishments and experience that is constantly encouraged and supported by others. Without this delight, the well goes dry, sooner or later. Ultimately, each contestant had to do the work of preparing for today him- or herself: hours, weeks, months, years of lessons, classes, and practicing, practicing, practicing. Thirty minutes before the scheduled audition time, a symphony volunteer leads each contestant to a dressing room to warm up. Despite their differences, all share an earnest expression – a determination – as they walk backstage. Although all or nearly all of them have been to the hall before (some many times), many of them have never been past the doors that are locked and off-limit to the general public. Some walk wide-eyed, clutching their instrument cases, some look down at their feet – all are quiet. Symphony musicians are practicing in dressing rooms not being used for the competition: intimidating strains of Brahms and Mahler compete with the muted sounds produced by the contestant currently on stage, and the other contestant who is already back here preparing for the next quarter hour. The door closes and they are left alone. All the preparation that has been or can be done is in the past now. There is only time to tune up, rosin the bow, adjust the mouthpiece or find the best distance between the bench and the piano, and set mind and hands together to the instrument for a few minutes and hope to reestablish the connection – the flow that develops between instrumentalist and instrument where separation falls away. In a short quarter hour the door opens and the accompanist is ushered in, there is a brief greeting and exchange, and now it is the last opportunity to rehearse before the moment arrives. Some set to and run the entire piece – there is barely enough time – others only review a few particularly tricky moments, or cadenzas, or beginning, or ending. In a dozen minutes there is a knock on the door, and the contestant and accompanist are escorted to the stage. Three of the contestants will be selected to continue to the finals tomorrow, go through all of this a second time, and the winner of that round will be the featured soloist with the symphony on a concert in May. While some of the contestants will return next year, and some will continue their musical pursuits into college and beyond – winning auditions to attend music school, perhaps even finding positions as professional performers or educators as adults – for many of those who auditioned, today’s experience will become a memory of their childhoods. They will ultimately choose other careers. For them music will become an avocation, a bright thread running through the fabric of their lives. Years from now, one of the contestants may come across her instrument in a closet and open the case which has been closed for so long. Holding the instrument in her hands again, she will remember how it felt to play on that stage today. 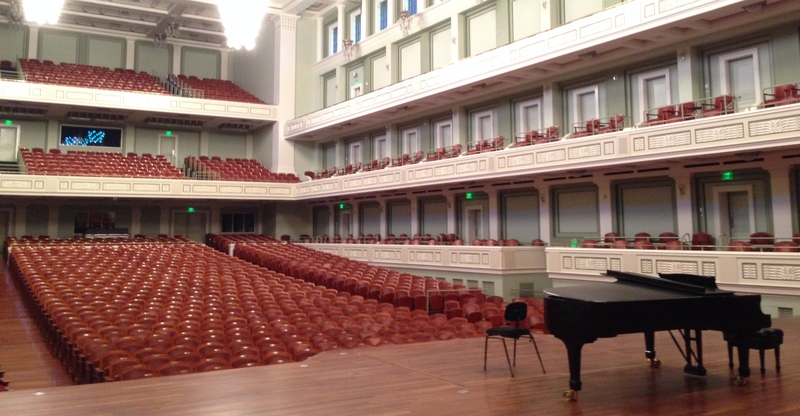 By walterbitner in Concerto Competition & Side By Side, Music Education, Nashville Symphony Programs on March 17, 2015 . Walter, this is terrific! It paints a vivid picture almost through the competitors eyes. One can almost feel the nervousness emanate from the page! Thank you, Pam. It is quite an ordeal for these young people – I was keenly aware of that all weekend and I thought it would be interesting to try to capture some of that intensity when I was pondering how to write about the experience. I find it incredibly incorrect that you would state that Homeschoolers “have a distinct advantage”. I find this to be most definitely incorrect. I hope you weren’t a judge of the competition, because your clear level of bias towards public/private schoolers would have caused for a very unfair competition. Thanks for sharing your opinion – to me it seems clear that homeschooled students simply have much more time available to them for preparation: that is their advantage over children who attend school. The identities of students in a competition like this are kept from the judges as much as possible – each entrant receives a number by which they are identified within the competition. Their school situation does not enter into how they are evaluated at all – what is judged is the performance in the audition.